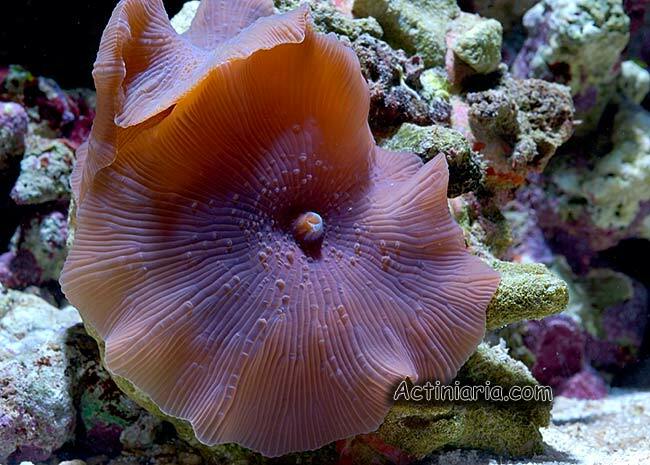 This very popular among marine aquarium hobbyists species comes with many colour forms. It has disc with smooth margin (no marginal tentacles) and few small wart-like tentacles arranged radially on the disc. It attributed usually to Discosoma nummiforme - a type species of genus Discosoma originally described from the Red Sea. We cannot say if this name correctly applied to Indonesian species - the original description of D. nummiforme is short and original figures are too schematic. Den Hartog (1980) examined type specimens but failed to give any redescription, he said only that the discal tentacles are principally dendritic (=branching?) and mentioned marginal tentacles. We do not observed any marginal tentacles in Discosoma spp. although margin of the disk may have slight and not prominent crenulations. And discal tentacles do not appear to be dendritic. Also Den Hartog observed thickened radial ridges on the disk - are these a result of fixation? 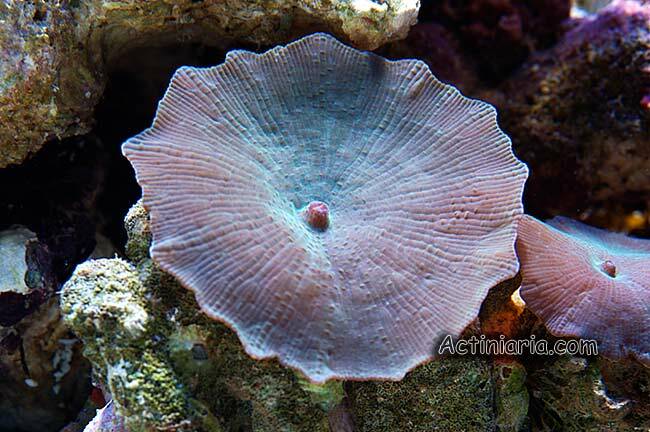 Anyway, it would be very interesting to compare living specimens from the Red Sea with Pacific specimens, so if you have any (preferably good) photos of living Discosoma (or related Rhodactis) species from the Red Sea, please, drop us a message.